It is important to remember that poverty in Toronto outgrew its shelter system many years ago. 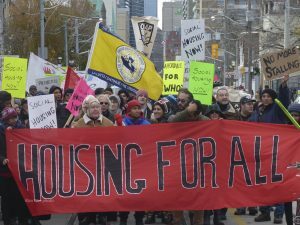 It has been two decades since the city council was forced to confront this reality and make a commitment to never let its shelter occupancy exceed 90 per cent, above which spots cannot be guaranteed to those in need. Not only did they never meet that commitment, they also ignored repeated alarms sounded by homeless people and their allies about the worsening conditions. The consequences of that neglect are unfolding before us. 94 homeless people died in 2017, a horrifying average of 2 every week. Recurrent outbreaks of infectious diseases in shelters have killed multiple people and made many sick. Even the respite centres, which serve as a sub-standard back-up to the overburdened shelter system are overcapacity, with over 700 people sleeping in dreadful conditions. Mobilizations of homeless people and their allies amid record breaking cold temperatures this winter triggered widespread public outrage about the City’s handling of the homeless crisis. The Mayor was forced to relent and some key immediate measures, such as the extension of the respite centres until the end of the year, have been won (though the City is yet to release a plan outlining how it intends to do so). However, the underlying problem of the shortage of beds remains unaddressed. On February 12, the fate of many people in our community rests in the hands of politicians who have shown themselves capable of ruthless disregard of the poor. The addition of 1500 beds this year is crucial to curb the crisis, alleviate suffering and preserve basic human dignity. Join us at City Hall that day to drive that point home and to remind councillors that we intend to fight to win. Call, write or visit your local councillor and tell them budget enough resources to add 1500 shelter beds this year. If you write to your councillor, cc us (ocap@tao.ca). You can find the councillor for your neighbourhood here. Help spread the word about the action on the 12th. Distribute this call-out, and the poster and flyer for the action within your networks. If you need printed copies, get in touch with us at 416-925-6939 or email us. 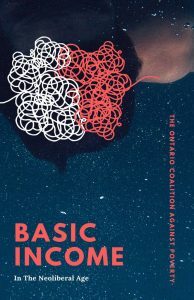 Our allies at the Socialist Project have published writings by OCAP organizers on Basic Income as a pamphlet. It is being officially launched at a social they are organizing on Saturday, February 3rd. You can download the pamphlet here, but we encourage you to also come out to the social and get a free copy. Join us on January 24! Join us Wednesday at 8:30 am at City Hall to Fight for Beds and Better Conditions. Eight city councillors released an open letter last week calling on their fellow councillors to keep the respite centres open past April 15 and reconsider the motion to open at least 1000 permanent new shelter beds this year. Both are key demands of our upcoming action on Wednesday, January 24. Remarkably, Mayor John Tory and Councillor Joe Mihevc were among the signatories of the letter, an impressive about face just over a month after both of them colluded to defeat a similar motion back in early December. This is a significant development, one that would not have been possible without our collective resistance, including the substantial support that Wednesday’s action has garnered. It is important to remember, however, that the fight is far from over. The motions still need to be passed by the majority of council, and necessary resources need to be allocated in the 2018 budget. It is more important now than ever to keep the pressure on the city to build shelter and improve conditions. On Wednesday, we will also be demanding that the city address the appalling conditions in the sub-standard back-up facilities: warming centres, drop-ins, and volunteer-run overnight programs. These facilities lack adequate washrooms and lockers; additionally, reports of stressful, unsanitary conditions are commonplace. Yet, having nowhere else to go, over 700 people cram in nightly in these centres. Yesterday, reports emerged about a homeless man at the Moss Park Armoury being rushed to hospital after being in medical distress for over a day. Fellow residents at the armoury spoke of their repeated pleas to get him medical assistance being ignored, until his life was put in jeopardy. Public outrage about the deadly crisis facing Toronto’s homeless may have compelled Mayor Tory to shift his position, but that means little unless it translates to action. In order for that to happen, we must let it be known, in no uncertain terms, that unless the very basic demands we put forward for preserving human life and dignity are met, this struggle will continue to escalate. Join us! Homelessness Doesn’t End in April: Build Shelters! The Mayor meets with his executive committee on the 24th. His preliminary budget puts grossly insufficient funds towards addressing the shelter crisis, meaning the horror will continue for homeless people. We have all been witness to the shameful scramble that characterized the City’s response to homelessness as cold weather gripped the city. Despite being warned about the worsening crisis within Toronto’s homeless shelters innumerable times, Mayor John Tory and the majority of city Councillors voted to defeat motions that would have initiated the addition of 1000 permanent new shelter beds and opened of the federal armouries in early December. 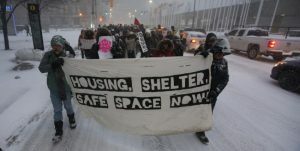 Extreme cold and public outrage forced Tory to back-peddle and open the Moss Park armoury in January, but the underlying problem of the severe shortage of shelter beds remains unaddressed. This means, come April 15, when the winter respite centres close down, over 650 people currently crammed into overcrowded warming centres, drop-ins, and volunteer-run overnight programs will simply be dumped back on to the streets. Homeless people in Toronto are in crisis. 8 homeless people are dying every month. Emergency shelters, whether they serve women, men, youth, refugees, or families, are all packed full every single night, winter and summer. Even the sub-standard backup drop-ins are full, despite conditions within most of them being appalling. The current situation demands the addition of at least 1500 permanent new shelter beds to guarantee a spot for everyone in need. The City’s plan, at-best, might add about 400 beds over 2018; an expansion that will soon be undermined by the impending closure of Seaton House. This means the crisis will persist, along with its lethal consequences. We cannot allow the City Council to feign surprise about the predictable consequences of their actions. We cannot allow the City’s callous neglect to keep jeopardizing the lives and safety of homeless people. 1. 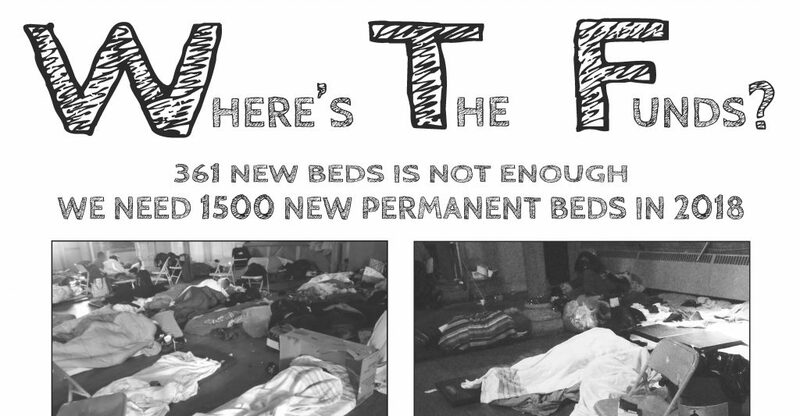 Add at least 650 permanent new beds to the shelter system by April 15 to create space for those currently forced to stay in the respite centres. These centres must not be closed until every single person staying there is guaranteed a shelter bed. Furthermore, conditions within the respite centres must afford basic human dignity to its occupants. 2. Add at least 1500 permanent new shelter beds this year, primarily within the downtown core, close to TTC and other services, and in facilities that accommodate the needs of homeless people, particularly women and non-binary people. 3. Stop the closure of the hundreds of social housing units that still remain on track to be boarded up. 4. Budget enough resources to accomplish the above within the 2018 city budget. 5. Stop racist and disablist scapegoating of shelter users. The shelter crisis wasn’t created by refugees or mental health issues. This crisis is a direct result of the failure of all three levels of government to address the housing and income crisis facing poor people. A homeless man died at the Salvation Army Maxwell Meighen shelter yesterday. We watched in the early afternoon, along with others, as he was brought out in a black body bag, placed in the back of a van, and driven away. Who was he? What was his name? When did he die? Was he young or old? Did he have serious health issues? Was he depressed? Was he born in Toronto or was he from another city? Does he have a family? Will be be buried in a pauper’s grave? The city is scrambling to address to address a serious homeless crisis. A man enters a shelter and leaves in a body bag. What happened to him? When did he arrive at the shelter? How long was he there? How long had he been homeless? Does anyone at the City care enough to answer these questions? The Coroner? The Police? The shelter management? Will those who have answers to these questions break their silence? Should we not all know that a homeless man died there yesterday in these extraordinary times? Should we not ask what happened? All of us should be troubled by the images of a dead man being carried out of a homeless shelter. All three levels of government must act to address this crisis. We cannot allow this to go on. 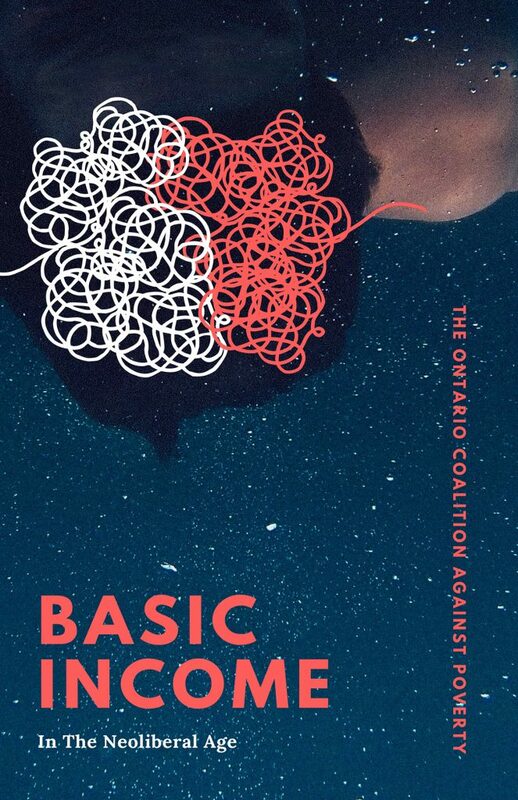 Thursday, January 18 | 6pm-8pm | CRC, 40 Oak St.
Toronto is in the midst of a deadly crisis of homelessness. We know all three levels of government are responsible for creating the housing crisis and then refusing to deal with the consequences. But how exactly have they done this? What precisely is wrong with the Canadian housing policies? How to we make sense of the claims of “historic investments” in housing that the Liberals made when they announced the National Housing strategy last November? Will the strategy help poor and low-income people? Over the past month we’ve won the opening of the armouries to provide immediate respite to the homeless but the fight for shelter is far from over. How do we build on the gains made to win adequate shelter in the coming months and housing for all? 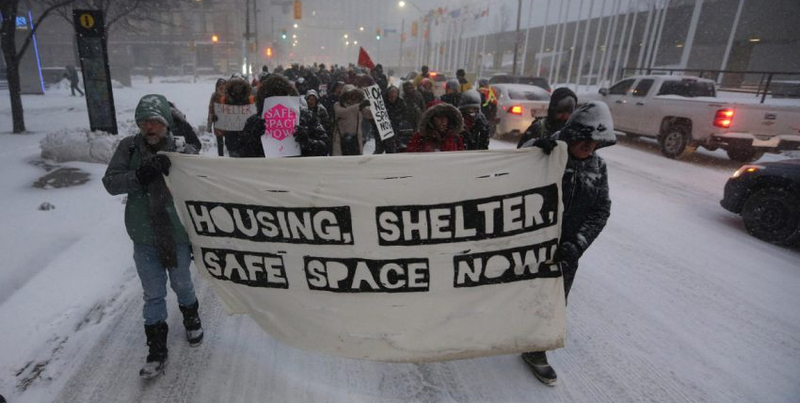 Toronto – January 5, 2018 – Almost a month after officially refusing to request the opening of the armouries as emergency shelter, Mayor John Tory has caved under mounting pressure and requested the use of the Moss Park armoury. Communication from the federal government today indicates that the armoury will open tonight as a 24/7 winter respite center for two weeks. “The immediate opening of the armoury and involvement of all three levels of government is a good step and an important victory for homeless people in this city,” says Gaetan Heroux, a longtime OCAP organizer. “Despite the opening of the armouries, it’s clear that the city continues to scramble. We still have questions about what the Provinces role will be and want to make sure the new space is adequate. Also, all winter respite programs end on April 15th but, homelessness doesn’t end on April 15th,” Heroux adds. We are also calling on Mayor Tory to stop his racist and disablist scapegoating of refugees and people with mental health issues. He consistently names these groups as part of the cause of the crisis. The shelter crisis has been ongoing for over 2 decades and has intensified in recent years as a result of Council’s neglect, and the housing and income crisis. Social housing units are being boarded up, there isn’t enough low income rental housing, and social assistance rates are too low. Refugees and people with mental health issues are the casualties of policies enacted by all three levels of government. The way to resolve the shelter crisis is to ensure the shelter system’s capacity levels are maintained at 90% – a City Council mandate that has never been met. Occupancy rates are consistently 95% or higher which means that it is often impossible to get a shelter bed and the shelters are overcrowded, unsafe and prone to disease outbreak and bedbugs. The city needs to ensure that the budget includes sufficient funds to make that happen. Like many improvements to the shelter system over the past decades, OCAP and our allies fought for and won the opening of the Moss Park Armoury. OCAP will continue to fight for sufficient beds and better conditions within the shelter system, and for social housing – and we fight to win. Our monthly Social Justice Speakers Series will be taking a break in December and resuming on Thursday, January 18. The Speakers Series happens on the third Thursday of every month from 6pm to 8pm at the CRC, located at 40 Oak Street. It’s where we gather to discuss issues that are critical to the success of poor people’s movement. It’s where we build our capacity to fight to win. We’ll have information about the January session up on the website by the end of this month.